Keith Livingstone: Healthy Intelligent Training - als eBook kostenlos bei readfy! 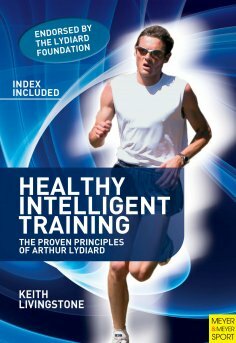 Healthy Intelligent Training is for all serious middle distance athletes and coaches. It is based on the proven principles of New Zealand's Arthur Lydiard, the Runner's World 'Coach of the Century', who trained a motley band of neighborhood kids into feared Olympic medalists, and kept on doing it, around the world. These principles have since guided athletes from many nations to world records and Olympic Gold medals. Now you can plan your own campaigns, and understand exactly what you're doing at every step. This book can be used and understood by everyone. A former national-level runner and race winner over track, cross-country, and road in New Zealand and Australia, Dr. Livingstone, a coach and chiropractor, has joined forces with fellow enthusiasts, Olympic-level coaches, and Olympic medalists to provide a simple, logical template for you to plan your own winning programs. You'll be taken through each successive layer of the training pyramid, and understand what type of work fits in at each level leading to peak performance. You will understand the physiology very clearly and simply so that you will know which workouts will help, and which will hinder. Keith Livingstone is a chiropractor who lives in Bendigo, Australia, with his wife and five children. He grew up right on Arthur Lydiard's doorstep amidst the running boom of the mid 1970s. For over ten years Keith was nationally ranked as a distance runner in both New Zealand and Australia, over track, road, and cross-country, and he won a number of regional and national titles. He knew, raced, or trained with most of the great runners in New Zealand and Australia during the golden era. In 1990 Keith helped his current coaching colleague John Meagher to a debut marathon time of 2 hours 16 minutes, and later to a Melbourne Marathon victory, triathlon titles, and three titles in the World Masters Games. Their HIT Squad currently boasts three nationally ranked senior 1500 m runners.